Garrincha (28 October 1933 – 19 January 1983) was a Brazilian football player. He played for Brazil national team. Garrincha was a heavy drinker who died of cirrhosis. Wikimedia Commons has media related to Garrincha. 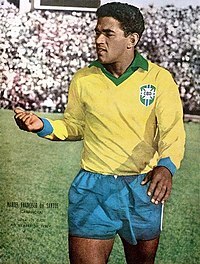 ↑ "Manoel Francisco dos Santos "Garrincha" - International Appearances and Goals". www.rsssf.com.